Men’s Waistcoat Josh in Bison Brown. This classic Josh brown waistcoat is the ideal garment to wear when you want to show off your rugged yet uniquely stylish side. The waistcoat is made from a blend of 50% wool and 50% polyester that is both cosy and versatile at the same time. 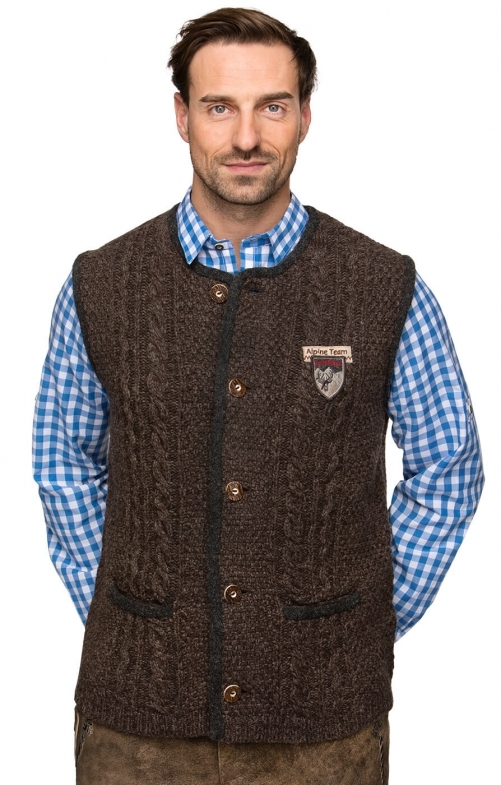 The garment boasts a traditional knit pattern running through it, while the bold bison-brown colour is perfectly complimented by the dark edging down the front and on the collar that is matched by the edging on the two pockets on either side, while the shield on the left breast adds an extra touch of masculine charm.